Jihad Watch : Imagine what would have happened if Morocco had lost. BRUSSELS (Reuters) – Celebrations in Brussels to mark Morocco’s return to soccer’s World Cup finals for the first time in two decades turned violent late on Saturday, when crowds clashed with police, setting cars on fire and injuring 22 police officers. Images on social media showed overturned, burning cars and broken shop windows in Brussels city center as well as police trucks firing water cannons at crowds gathered in front of the city’s stock exchange. 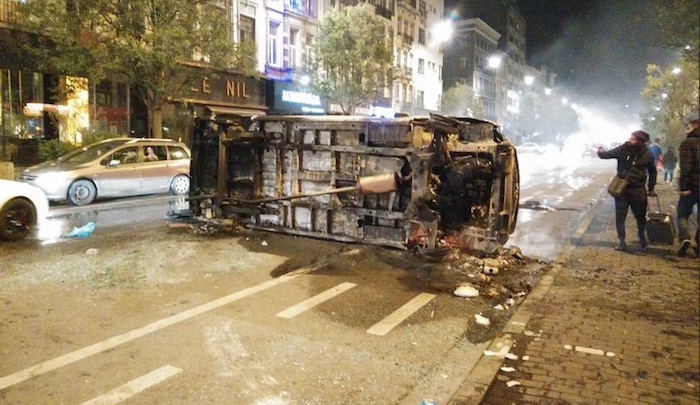 Brussels police said that of some 1,500 people had come to celebrate Morocco’s 2-0 win over Ivory Coast, but that around 300 started to behave violently and attacked police officers and firemen called to put out burning cars and dust bins. More than 100,000 people of Moroccan origin live in Brussels. Belgium saw an influx of Moroccan workers in the 1960s and 1970s. Yeah, sure, you’ll hold them to account, all right.